I hesitate to quibble but I believe there is an error in one of Arthur North's drawings. He has given the Parcels unit a full set of roof vents but they only had couple, not like the passenger version. I know this from detailing a Lima one several years ago. I don't have any pics to hand but am fairly certain it was the case. As it happens, I had cab ride in the parcels unit from Slough to Windsor and back when I was a lad. My uncle was the driver! I grew up in Windsor in the 1950s and remember when the first railcar arrived to take over the Slough-Windsor shuttle from the auto-train. I nearly jumped out of my skin the first time I saw it when it revved up to get going. It really echoed and magnified the sound under the platform canopy! I seem to recall it was one of the early cars with headless buffers, butI may be wrong on that. This view must be not long afterwards. According to a drawing in The History of the Great Western AEC Diesel Railcars by Colin Judge there are eight vents, four each side on the roof of the parcels van. There are 16 , 8 each side on the passenger version, plus two large vents for the heating system exhaust. These are both the razor edged bodies of the later type. If you have not seen the book I can thoroughly recommend it. I have a passenger version no 22 and it is one of my favourite GWR items and the roof vents on that, a Lima model are correct. Not a terribly good photo from my collection - origin unknown. GWR Parcels Railcar 34 approaching Paddington sometime in the first quarter of 1948 as the GWR 'Shirtbutton' logo has been hastily painted out and the number has been modified, possibly the 'No.' prefix replaced with W or GW bearing in mind that the brand new British Railways still had to work out the finer details of regional numbering and identification. Parcels Railcar W34W in its final livery of Carmine Red, not Maroon as depicted incorrectly on the Lima model. Both photos show a consistent roofline with only shell vents and no boiler flue. You seem to have confirmed my original thought. First the previous article is in the March 1980 edition of Model Trains and not May as stated. There is only one photograph in common between the two articles and the earlier one includes a useful closeup with details of the bogie as running with only one axle driven. This article also shows that the reprinting of articles from other magazines by Chris is by no means new, there is a copy of one from the contemporary Meccano Magazine. The photograph on page 267 can only be of No. 19, as No. 6 was one of the earlier Gloucester Bodied Cars. The engines used in the later GWR railcars were identical with those of the Matilda II infantry tank. The Matilda used two engines one turning clockwise and the other anticlockwise. These engines were produced in pairs. 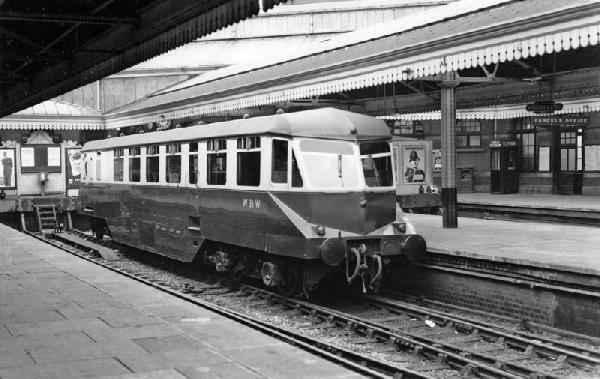 When the GWR was allocated the engines for these railcars, the other engines was allocated for use in Wartime Utility buses. I meant to put this with the above, but somehow it got dropped off. The article in the May 80 Model Trains was of DMUS in general. There is an article on detailing and converting to EM gauge in the August 82 Scale Trains.